# I have saved the data from the survey after completing the survey myself. # data every so often. Thus survey results are lost sometimes. # to be either Advanced (119) or Moderate (92). # The majority of users are aged 26-35 (121) or 36-45 (79). # most frequently daily (164) or weekly (75). # to become a dating website in the near future. # chose data analysis (150) followed by (statistics). # Basic (118) and Non (76) being the most frequent responses. # and frequency of reading R bloggers. # reading R bloggers and self assessment of R expertise. # spectrum is a useful variable. 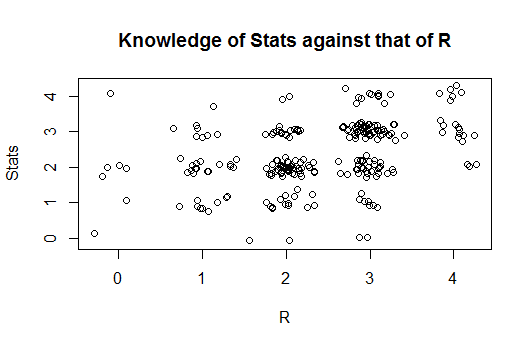 # stongly positively predicts knowledge of R.
# there exists some relationship. # many users, learn R simultaneously with statistics.